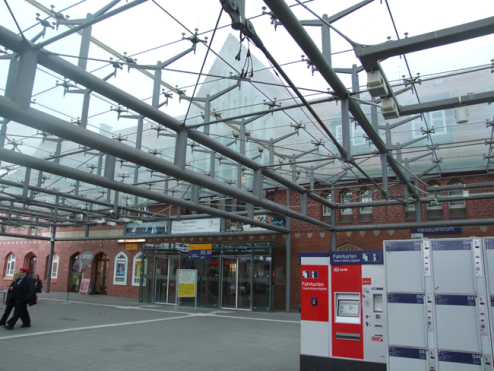 The public address system was renewed in all public areas of the station building in compliance with the requirements of voice alarm systems according to DIN VDE 0833-4. Particularly noteworthy is the lobby. This has a very sophisticated room acoustics and is subject to monument protection beacause of elaborate, old murals. Here very different loudspeaker types and arrangements were tested by computer simulations. With a usual noise level assumption of 75-80dBA, no success could be achieved. A 24-hour measurement with data loggers resulted in a mean level of only 65dBA, under which the necessary speech intelligibility values ​​STI could be realised.